The AHDB Outlook for UK pig meat supplies, produced back in October, has been reviewed to take account of recent developments in production and trade. Clean pig slaughter was lower than expected during Q4 last year, falling 1% below 2017 levels. This meant UK pig meat production during the quarter was 2% behind a year earlier, as average carcase weights were slightly lower. It is thought that fewer pigs were pulled forward for Christmas this year, due to poor demand for standard pigs as cheap continental pork proved more attractive. 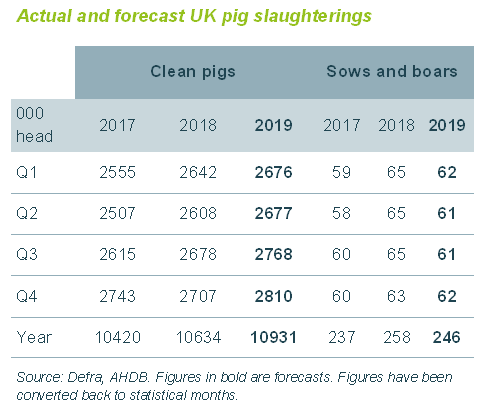 This has made more pigs available in January; so far this month GB estimated slaughterings have been 6% above 2018 levels. However, other factors may also have been at play that limited slaughter towards the end of last year. The latest APHA disease surveillance report suggests disease continued to be a challenge throughout the summer, which may have impacted supply availability. It is difficult to anticipate how this might develop moving forward. Herd performance is also expected to be affected by poorer fertility rates during the hot weather last summer, which should start to impact throughputs from the end of Q1 and into Q2 this year. Beth Wilkins, a market intelligence analyst at AHDB, said: “The AHDB forecast has been revised down slightly to take account of the risk that herd performance might not improve as much as expected this year. Nonetheless, throughputs are still expected to be up 2-3% on 2018. Ms Wilkins added: “UK imports were higher than expected towards the end of last year, likely reflecting the competitive prices available at the time and some stockpiling activity in light of Brexit. Without clarity on Brexit, it is difficult to anticipate how imports will develop this year. Nonetheless, higher production levels should deter an increase, but this will depend on the prices on offer. More details on the outlook for UK pig meat supplies can be found by clicking HERE.